After a no show from the northern lights on the first night, we got up early on the second day intending to head to the Perlan and watch the sunrise, before heading out on a whale watching espedition. Breakfast at Hotel Klettur was good, with the usual options of cereal or continental breakfast. One this I always try to do when being offered a continental breakfast is to make myself a cheese, ham and tomato sandwich to stow away for lunch later, and I even managed to pinch some pastries for pudding too! 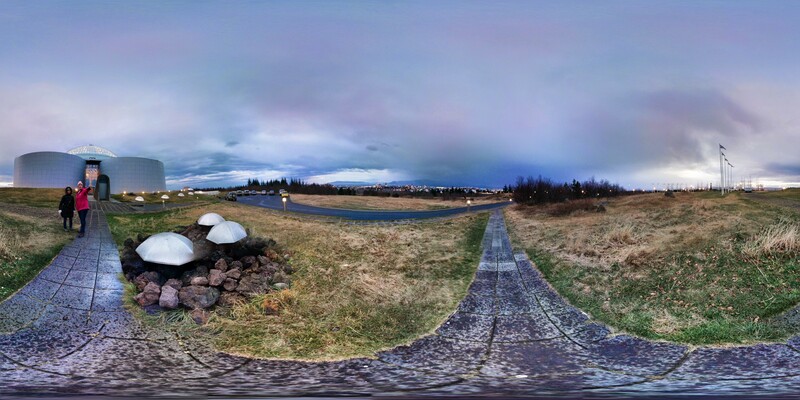 Standing on top of the Oskjuhlio hill at 25.7 metres high, the Perlan provides excellent viewing of Reykjavik and the surrounding area. Unfortunately sunrise was 09:50am and the Perlan didn’t open until 10am, plus it was quite cloudy, so although we didn’t quite get to see sunrise as we intended, we still got some amazing panoramic shots from the viewing deck. Afterwards we headed back to the hotel for pick up for our Whale Watching Excursion. Our boat tour was organised through Gray Line, but operated by Elding. 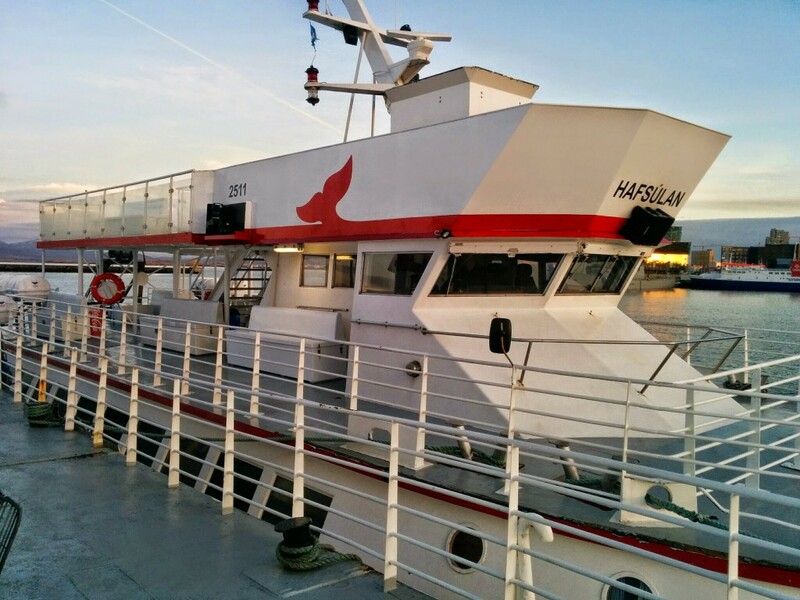 Our ship was the Hafsulan, and at 1pm we headed out in search of Whales and other marine life. We were warned that the sea could be quite rough, and were provided with complimentary sea sickness tablets, and waterproof overalls, which were not compulsory, but I would highly recommend taking advantage of both. 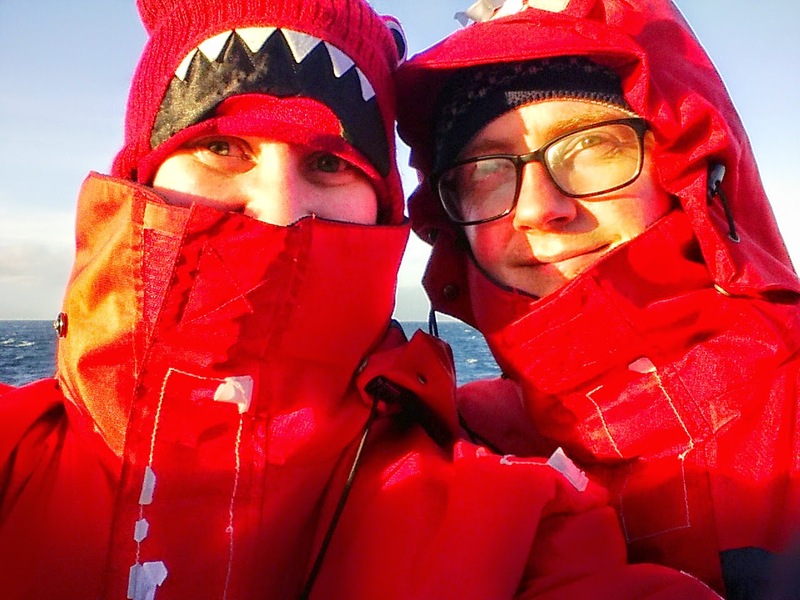 The overalls were brilliant, if not a bit difficult to get into, and highly unflattering, I barely felt the cold the whole trip, even though we were stood right at the front of the boat. Being sprayed did not affect me, and I was well protected from the winds. I would still recommend dressing warm underneath, and of course a hat, scarf and gloves are still a must to bring along on this trip. The official write up for our trip can be read here, but in short, we were tipped off on the location of a small group of white-beaked dolphins. Once we found them, being positioned at the front of the boat gave us a great view of them bow riding! We were a bit disappointed that we didn’t get to see any whales, but seeing the dolphins was really amazing. Heading back the ride was rather choppy, but I actually quite liked the feeling, although after 3 hours at the head of the boat, I did start to feel a bit chilly and headed downstairs for the rest of the journey back to the docks. Once back in Reykjavik we headed to the Gamla Vinhusid Steakhouse for dinner. As I will always try anything once, we decided to order a horse fillet steak and a minke whale steak, both with green peppercorn sauce, vegetables and jacket potato. As recommended by the chef, both were ordered rare, and we were definitely not disappointed! The horse was a lovely sweet red meat with a hint of gaminess to it, and the whale was a lovely red meat, with no fishy taste to it (yes I know it’s a mammal but for some reason I still expected fishy tasting white meat), it was bit sinewy in places, but overall I really enjoyed the meal. I am aware that the minke whale is an endangered species, and on the tour we had been educated into how they are working to prevent the killing of these creatures for meat, but unfortunately my desire to give it one try was too much. Although it is illegal to import whale meat to the uk, I will definitely be ordering myself some horse steaks again at some point as a treat now we have returned. Throughout our time in Iceland, we had often been told how amazing people had found the Blue Lagoon and I wondered if I would regret not booking this as one of our excursions, although we did have our visit to the Fontana Spa the next day, we decided to see if we could fit in a quick trip to one of the local swimming baths as well to make up for not going to the Blue Lagoon. We found a bath quite close to our hotel, but it closed at 8pm (it was already 6.30pm at this point) and being quite tired, we decided just to head back to the hotel and get an early night, as the next day would be a very long one. Even though we could rejoin the Northern Lights Tour for a second night, the forecast showed even more cloud than the previous night, whereas the following night would be clear, so we decided to skip the second night and instead book on again the last night.